Not much really. I used to like Lost though, haha! Thanks for the tonne of notifications That's actually pretty impressive, though I don't think your playing was as clean as the last video, haha! You've got the MIDI stuff nailed though, I don't think I'd have the patience for all that! Interestingly, Feeder have a new album out this year apparently. I liked All Bright Electric a lot so hopefully it's good. It's funny that you always mention Buck Rogers though, it would probably only be my 7th or 8th choice from that album alone, haha! If we're including songs that weren't even on it, then Just A Day tops them all, haha! @Ross0203 - Sounds great! It'll be worth the long wait when you get the chance to play it as well. Look forward to seeing some pictures here! @james90 - Haha, you could follow everyone on the site if you wanted to! xD @Ross0203 - That's great! Hope you have an awesome day! Open it in a room with lots of sunlight if you can, you get the extra specialness of seeing all the sparkles as you open the case for the first time. Woops. I'm still getting used to the new board, haha! Awesome! It's weird to think I've had mine for 7 years now. I've just started playing it again for the first time in a while actually. It's still as good as ever! My internet's fine, haha! I thought it was the site you'd used to upload the video or something, but never mind! That's pretty cool. I didn't realise it was a Fuzz Factory and Whammy going together, I didn't even know that was possible without it sounding completely terrible. I thought you might have been doing some kind amp modelling thing or something, but whatever it was sounded pretty much spot on. Very nice! It took me about five minutes to load the damn video but it sounds ridiculously accurate, not just the notes but the tone/effects as well. How the hell have you done that? Assuming I'm doing this right... - The piano arpeggios in the chorus of Stockholm Syndrome are always something that I've loved but I can imagine going unnoticed or unappreciated by others. - The background effects that somehow add so much to the song in (among others) Shine Acoustic, Hyper Chondriac Music, and the outro to Citizen Erased. - They might not count because they're so prominent, but I'll also add the strings in Blackout. I even love the instrumental version at the end of H.A.A.R.P. I'm now imagining walking down the street, looking over my shoulder, and seeing a man with a Kaoss Pad for a face hiding behind a lamppost, haha! That Unsustainable video is insanely accurate by the way. Really nice work. Haha! @james90 - Actually the rectifier thing got sorted out years ago. It did go through a few quite quickly in the first year or two I had it, but then I found out I had an older model, and that problem had been resolved on newer ones later. I called them up and they said the fix was offered as a free upgrade if I could post the main part of the amp to their nearest facility or whatever. I think I got it back about a week later and I've never had another problem with it since. They threw in a spare rectifier tube to make up for the ones I'd had to buy before as well for good measure. Very nice service. Haha! Did you have to Google 'Kaoss Pad - no, not that one, the twisty one'? Wait, hang on, does that mean we don't have the old emoticons anymore? Or are they still there? Oh good. Inconsistent sizes but better than nothing, I was lost for a second there, haha! I don't actually remember having any problem with my amp, it was the two pedalboards that took ages and then I got hit with a huge import charge as they were so big and heavy after I'd packed them with books and clothes and stuff. Fun times, haha! Krr, this is Ground Control to Major Tom, can you hear me Major Tom? Krrrrr... Are we back? Thanks for the heads-up by e-mail, James! I've been checking every now and then to see if the new site was up but was starting to think it was never going to happen. I was just going to check again today and here we are! Hope I can get the hang of the new layout, haha! 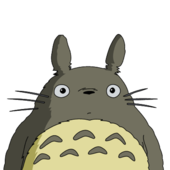 Hey, my Totoro's gone! Well, I'll soon fix that!